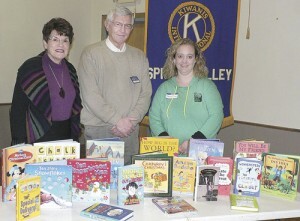 The new additions to the library are tied to the programs and speakers at meetings of the Spring Valley Kiwanis, which has a mission of serving the children of the world. “At the end of our Kiwanis meeting, the speaker of the day is asked to choose a book from the stage, where we have several books laid out,” explained Spring Valley Kiwanis Club member Nancy Cornell. The book is then donated in the speaker’s name to the Spring Valley Public Library. The club holds a meeting each Wednesday noon at the Spring Valley Community Center, and often, there’s a guest speaker, be it someone who’s been on a mission trip to another country as a result of a sponsorship through the community or representatives of other organizations, outlining what they do and why or how they might work with the Kiwanis to make the world a better place. At the end of each presentation, the speaker receives a framed certificate from the Kiwanis as a token of appreciation – and the Kiwanians, having graduated from giving unframed certificates to framed ones, declare that the certificate is “suitable for hanging” and invite the speaker to choose from the stack of books on the stage after the meeting. Cornell stated that her husband, Denis, also a Kiwanis member, then keeps track of the book until it is donated to the library. Spring Valley Public Library director Jenny Simon was the program presenter of the day this past Wednesday, Feb. 18, and like others, she received a “suitable for hanging” certificate, but was also privileged to take a diverse stack of children’s books back to the library, including “Ten Shiny Snowflakes,” “Mickey’s Christmas Carol,” “Middle School Get Me Out of Here,” “Diary of a Wimpy Kid: Hard Luck,” “Kate the Great,” “The Creature in My Closet,” “Snowmen at Night, Disney’s “Frozen,” and “You Will Be My Friend,” among others. During her program at Kiwanis, she gave an update on the upcoming events at the library – including the children’s summer reading program, with a “Every Hero Has a Story” theme this year, and a trunk show featuring the book “Moo,” appearances by the author and illustrator and activities to accompany the event. She also thanked the Kiwanis for their contributions to children’s literacy, reiterating that she is “very excited” to be able to offer new stories for the area’s eager small readers.